Parker's two-year contract with Miami has a base value of $11.2 million, with $4.5 million guaranteed and another $3 million available via incentives, Ian Rapoport of NFL Network reports. Parker is closing in on a two-year contract with the Dolphins, Tom Pelissero of NFL.com reports. Analysis: Reports earlier this offseason suggested the Dolphins would rescind Parker's fifth-year option and allow him to walk in free agency. 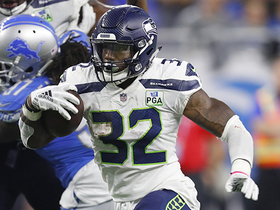 It now appears the team will give him a shot to establish himself with a new coaching staff, working on a two-year contract that maxes out at $13 million with incentives. The quarterback situation in Miami remains unsettled as the team begins a rebuilding plan under new head coach Brian Flores. Parker is unlikely to return to the Dolphins in 2019, Adam Beasley of the Miami Herald reports. Parker did not catch any of his three targets during Sunday's 42-17 loss to the Bills. He ends the season with 24 receptions for 309 yards and one touchdown. Parker caught two of three targets for 12 yards during Sunday's 17-7 loss to the Jaguars. 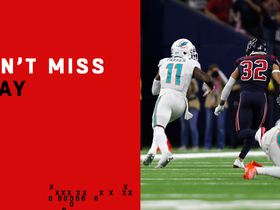 Analysis: The former 2015 first-round pick tied Danny Amendola for the most targets among Miami's wideouts during the Week 16 loss, which shows how much quarterback Ryan Tannehill struggled to make noise in the passing game. Parker has only exceeded 50 receiving yards in one game this season and has been phased out of his former role as a focal point in the Dolphins' offense. He'll remain off the fantasy radar heading into a Week 17 visit to the Bills. Offensive coordinator Dowell Loggains acknowledged Thursday that Parker has been phased out of the Miami offense, citing a "combination of injuries, production and practice," Barry Jackson of the Miami Herald reports. Analysis: The 2015 first-round pick essentially served as Miami's No. 4 receiver in last week's 41-17 loss to Minnesota, logging fewer snaps (19) and targets (one) than recent signing Brice Butler (25, 3). With Parker's fifth-year option guaranteed for injury only, the Dolphins have a huge incentive to keep him healthy down the stretch, though they also still have a slim shot to make the playoffs. There's little reason to expect him to suddenly reclaim a big workload Sunday against Jacksonville. Parker failed to catch his only target during Sunday's 41-17 loss to the Vikings. Analysis: Parker received less offensive snaps (19) than Kenny Stills, Danny Amendola and Brice Butler during the Week 15 loss. It's unclear whether the 2015 first-round pick was limited by an injury or simply has fallen to the No. 4 position in Miami's receiver room, but Parker won't be worth fantasy consideration Week 16 against the potent Jaguars defense. Parker (shoulder) does not carry an injury designation for Sunday's game against the Vikings after practicing fully Friday. Analysis: Parker, who caught one of his four targets for 18 yards in Week 14's 34-33 win over the Patriots, will be out there if you need him Sunday, but he's been a hit-or-miss fantasy option all season long, so he'd be a speculative lineup roll Week 15. Parker (shoulder) was a limited participant at practice Wednesday. Analysis: Parker has been restricted to non-contact work in practice the past few weeks but it hasn't affected his availability for gamedays. 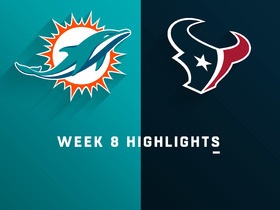 Since the Dolphins' Week 11 bye, Parker has suited up in all three of the team's games, catching eight of 15 targets for 71 yards and a touchdown. He should be fine to handle his usual role as a top-three receiver in the Miami offense in Week 15 against the Vikings, but there's reason to worry about both volume and efficiency. Parker caught one of his four targets for 18 yards during Sunday's 34-33 win over the Patriots. Analysis: Parker led Dolphins wideouts in offensive snaps (42) during Sunday's win over the Patriots, but was predictably unable to turn his usage into production. The 2015 first-round pick has burned fantasy believers all season, save for a Week 8 performance in which he caught six passes for 134 yards. He'll be difficult to trust in Miami's low-octane passing game heading into a difficult Week 15 matchup against the Vikings defense. Parker (shoulder) doesn't have an injury designation for Sunday's game against the Patriots, Ben Volin of The Boston Globe reports. Analysis: Parker will follow the same routine he did last week, suiting up for a game after logging a trio of limited practices. He overcame a tough matchup against Buffalo last week to record four receptions for 43 yards and a touchdown on seven targets, but the volume may be tough to duplicate with Danny Amendola (knee) trending toward a return. Parker didn't play in the previous Patriots-Dolphins contest Week 4. Parker (shoulder) was limited at practice both Wednesday and Thursday, Armando Salguero of the Miami Herald reports. Analysis: Parker's shoulder issue limited at practice last week as well, but he ended up playing in the team's Week 13 win over the Bills, logging 46 of a possible 55 snaps on offense in the process, en route to hauling in four of seven targets for 43 yards and a TD. With no reported setbacks in that contest, he should be fine for this weekend's game against the Patriots, though it remains to be seen if Parker is listed as "questionable" or removed from the Dolphins' injury report altogether come Friday. 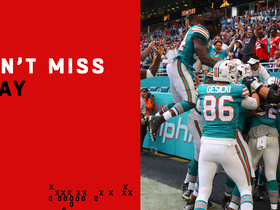 Parker brought in four of seven targets for 43 yards and a touchdown in the Dolphins' 21-17 win over the Bills on Sunday. 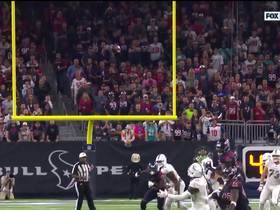 Analysis: Parker got Miami on the board with an 18-yard touchdown reception to cap off a 10-play, 75-yard first-quarter drive. 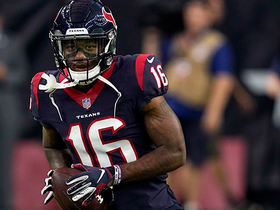 The oft-injured receiver had been dealing with a shoulder issue coming into the contest, but he appeared unencumbered while co-leading the team in receptions and receiving yards. Given the relatively low-upside nature of the Dolphins air attack, Parker remains a risky fantasy proposition against the Patriots in Week 14. Parker (shoulder) is active for Sunday's Week 13 tilt against the Bills. Analysis: Parker wasn't able to surpass limited practice participation all week, but he'll nevertheless take the field against a Bills defense that's been the stingiest in the NFL in terms of passing yards allowed per game (193.7). With fellow wideout Danny Amendola (knee) inactive, Parker should see an increase in target share. Parker (shoulder) is listed as questionable for Sunday's game against the Bills, Armando Salguero of the Miami Herald reports. Parker (shoulder) was limited at practice Wednesday. Analysis: Per Safid Deen of the South Florida Sun Sentinel, Parker sported a non-contact jersey Wednesday. The same applies to running back Kenyan Drake (shoulder), but the fact that both practiced in any capacity Wednesday suggests that they are trending toward active statuses Sunday against the Bills. Parker (shoulder) is expected to continue donning a non-contact jersey during practices this week, Safid Deen of the South Florida Sun Sentinel reports. Parker (shoulder) is listed as active for Sunday's game against the Colts. Analysis: Parker is available if you need him Sunday, but he's been hit-or-miss this season while only having suited up for five games. In that span, he's logged 14 catches (on 26 targets) for 225 yards. Parker (shoulder) remained limited at Friday's practice and is listed as questionable for Sunday's game in Indianapolis, Armando Salguero of the Miami Herald reports. Parker (shoulder) was wearing a red non-contact jersey at Friday's practice, Joe Schad of The Palm Beach Post reports. Analysis: Parker was limited to non-contact work at Wednesday's practice, and that appears to be the case again Friday. The continued practice restrictions make it increasingly likely the 25-year-old will receive an injury designation for Sunday's game at Indianapolis, though we won't know for sure until the Dolphins release their official injury report Friday. The Dolphins listed Parker (shoulder) as a limited participant on Thursday's estimated practice report, Armando Salguero of the Miami Herald reports. Parker (shoulder) practiced Wednesday in a limited fashion, Armando Salguero of the Miami Herald reports. Parker (shoulder) donned a red no-contact jersey during Tuesday's practice session, Adam H. Beasley of the Miami Herald reports. Coach Adam Gase said Monday there is a chance Parker (shoulder) plays Week 12 at Indianapolis, Adam H. Beasley of the Miami Herald reports. Parker likely will miss a few weeks, but the AC joint sprain in his left shoulder isn't expected to be season-ending, Joe Schad of The Palm Beach Post reports. Parker (shoulder) will not require surgery and is considered week-to-week with a sprained AC joint, Tom Pelissero of NFL.com reports. Parker (shoulder) left the locker room with his left arm in a sling after Sunday's 31-12 loss to Green Bay, Joe Schad of The Palm Beach Post reports. Parker was forced out of Sunday's game against the Packers with a shoulder injury, Adam H. Beasley of the Miami Herald reports. 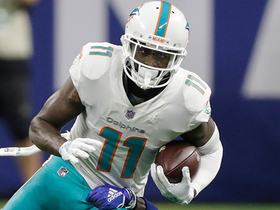 Analysis: The Dolphins' depth at wideout was further taxed by the fact that Jakeem Grant was carted off the field Sunday with a leg injury. Prior to his third-quarter exit from the contest, Parker had hauled in five of his 11 targets for 43 yards. Parker brought in one of two targets for eight yards during Sunday's 13-6 win over the Jets. 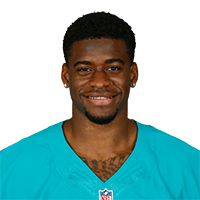 NFL Network's Tom Pelissero discusses the details of wide receiver DeVante Parker's expected new deal with the Miami Dolphins. 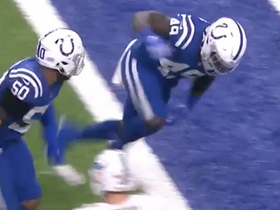 Indianapolis Colts linebacker Matthew Adams stops Miami Dolphins wide receiver DeVante Parker. 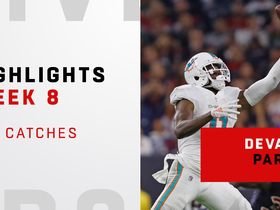 Watch highlights from Miami Dolphins wide receiver DeVante Parker's impressive Week 8 performance with 134 receiving yards. Miami Dolphins wide receiver DeVante Parker reaches with one hand for a throw from Miami Dolphins quarterback Brock Osweiler for a 30-yard gain.